Salon Shanti is located on the 2nd floor of Space 22 Bldg. near Uruma City Office. 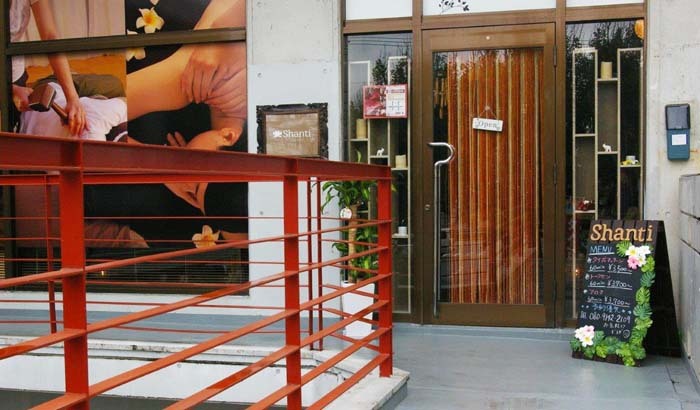 A new Thai Massage salon on Okinawa, Salon Shanti in Uruma City, invites customers to experience a real Thai massage that makes them feel like they’re down in Thailand enjoying a relaxation session. Izumi Yakabi (left) and Mai Takaesu are ready to welcome customers. A massage in Thailand is an integral part of Thai culture thought to date back more than 2,000 years. It stimulates and enhances the flow of life energy in the body that taps into ten major lines known as ‘Zen lines’. They’re the principal elements of 72,000 channels or streams of invisible life energy lines that surge through the body. Done properly, a Thai massage promotes increased blood and lymph circulation through pressure and gentle stretching of muscles. The massage therapist uses elbows, thumbs, palms, knees and feet to create an energizing, revitalizing experience. Salon Shanti has been in business since Jan. 21st this year. And although there are many Thai massage salons on Okinawa, Shanti has one of the nicest and most authentic feeling atmosphere. Relaxing music plays gently in the background, and people working at the salon are nice and friendly. There are two rooms, one with just one massage bed and the other with two beds. If you want to have a massage together as a couple or with a friend, this is the place. “Some people think Thai massage is painful, however, actually it’s not when done right. Besides, a customer is welcome to tell the masseuse if he or she feels anything wrong or painful,” Salon masseuse Izumi Yakabi says. Mai Takaesu, who also works at Salon Shanti, agrees. “Before, I also thought a massage is painful, however it really is not. You feel fantastic after the massage, and you even might have a good sleep during the massage. We love when people feel relaxed and free of stress here,” Takaesu says. Tools for “tok-sen” therapy, one of Shanti’s specialties. Currently, Salon Shanti is having a grand opening campaign offering the whole menu at flat $30 for 60 minutes. The menu lists a traditional Thai massage, oil massage, tok-sen, and shirodhara, with the traditional Thai massage and oil massage being the most popular. Tok-sen is a northern Thai practice that involves rhythmical tapping of muscles to relax them. In Shriodhara, liquids are gently poured over the forehead. It is used to treat a variety of ailments and also for pure relaxation. 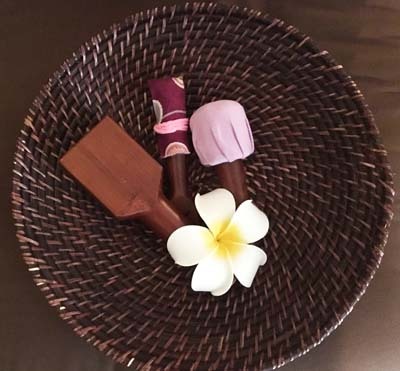 From June, Salon Shanti will introduce a new Thai reflexology massage, an oil massage using a reflex stick from the bottom of the foot to the area below the knees. The salon provides a free footbath to anyone who would like to try it. Shanti’s opening campaign runs through May 31, so now is the right time to give them a try. Reservations are easy on line on their English website. Salon Shanti doesn’t accept any credit cards, payments are in cash only, either in yen or dollars. As there is only one parking space, they recommend parking at a public parking space or sharing a ride with friends. The salon is open from 12:00 to 20:00 except closed on Sundays. The salon is located on Route 75 near Uruma City Office.